Private and semi-private instruction is available at all levels. Jessica believes private lessons to be the most effective means of teaching, especially at the beginning of training. The close, individual attention affords the most education and instruction and allows the team to progress at its own pace. There is a 24 hour cancellation policy in which students must notify Jessica of a cancellation or you will be charged the building rental fee ($20/h). It is the student ’s responsibly to arrive on time to their scheduled lesson. Seminar instruction is available. To arrange or inquire please email Jessica directly. Jessica is an approved Master level USDAA judge. She lives in New Jersey and will most often fly out of Newark International Airport. Jessica Ajoux has been involved in dog agility since 1999 and is currently an active competitor, instructor, and Agility judge. Jessica started her Agility career at the age of fourteen with her first dog, Mocha, a rescue from the pound. She has since expanded her knowledge of dog training through involvement in Tracking, Herding, Frisbee and Obedience. Originally from Southern California, Jessica is currently located in New Jersey. A graduate of Princeton University with a degree in Psychology, and former Division 1 collegiate athlete, Jessica considers herself a “student of the game.” She has trained and learned from a variety of top trainers from the US and aboard. She works hard to stay on the cutting edge of this ever evolving sport. Her greatest influence has been studying and apprenticing with world renowned dog trainer, Diane Bauman. Jessica competes with her dogs at the local, regional and National levels. She is an annual attendee of the AKC and USDAA National championships, consistently making it to the finals and the podium. Her sights are set on competing at the international level. Jessica started teaching in 2005 and has made it her full time job. She is familiar with a variety of breeds and has personally trained and competed with All-Americans, Border Collies, a Briard, Yorkie, Cocker Spaniels, and her newest dog a Chinese Shar-Pei. 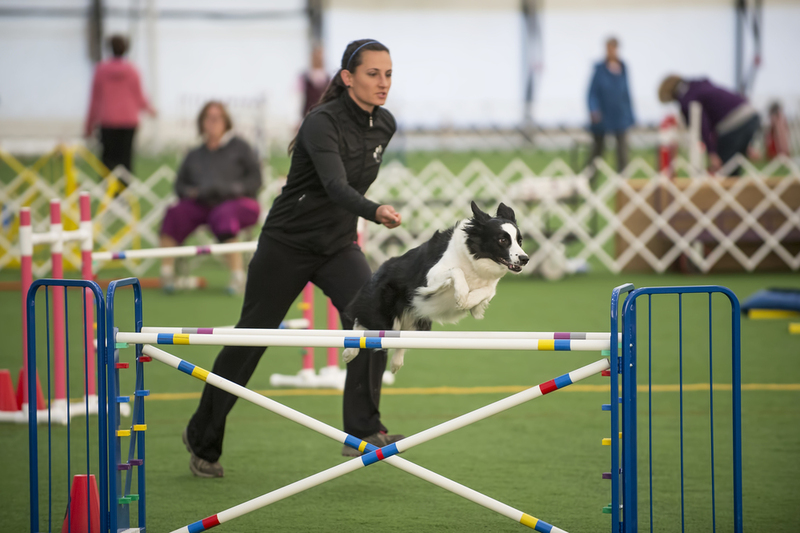 She believes that Agility is a sport for all dogs, though the methods and techniques can vary depending on the breed and personality types. Though her methodology always comes from a consistent training philosophy, how you communicate what you want with the dog depends on that dog’s “dialect.” Speaking “Border Collie” is quite different than speaking “Terrier”! Jessica is committed and passionate about sharing her knowledge and understanding of all facets of Agility with her students. She believes her job is to teach each human how to be an effective dog trainer and handler. She wants both dogs and humans to understand the how, the why and the when. That’s knowledge! When everyone understands and is confident with what they are doing- speed and success will arise. Jessica firmly believes that in order for one (either human or dog) to understand what is “right,” they must also experience what is “wrong.” It is through making mistakes and working through difficulties that we learn how to be successful. These principles permeate through her teaching, view points and life. I use LubriSyn to keep my dogs running at tip top shape! I feed my dogs Fresh Pet and they LOVE it! My favorite photographer is Bohm-Marrazzo Photography. No one makes me or my dogs look better! Glen Highland Farm A fantastic border collie rescue located in upstate New York. I found a great agility partner through rescue!